Enjoy an evening by the fire with the Monterra Lounge Chair Set with Occasional Fire Pit Table by OW Lee. At the center of this set is the stunning Santorini 54" Round Occasional Height Fire Table guaranteed to provide your gathering with reliable heat and light. To protect children and pets this set includes a glass fire guard. With beautiful yet durable wrought iron, generously sized cushions, and convex backs that contour to the body, the Monterra lounge seating in this complete set offers comfort and style not found with any other manufacturer. For added comfort all chairs in this set include motion bases for smooth swiveling or rocking motion. 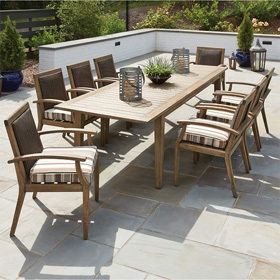 Monterra furniture is made to order in your choice of color and is guaranteed to resist mold, mildew, and fading. Lifestyle Photo:Shown in Graphite Frame Finish with Sailcloth Shadow (GS54B) Cushion Fabric. Table Top in Silver Oak. Spring Base Lounge 42.5"W x 38"D x 44"H 92 lbs. Swivel Rocker Lounge 42.5"W x 37.75"D x 44.5"H 94 lbs. Fire Table 72"D x 19"H 248 lbs. Fire Guard 28.75"D x 8"H 15 lbs.